Last time in the series, we read about how Jessica and Emma created a space that would work for them, both alone and with guests. This week, they move forward, with the help of a designer. Jostar came up with several ideas, our favourite being the above U-shaped kitchen with a breakfast bar. This solved the issue of Emma and I bumping into each other while working around the kitchen. It also solved the issue of having a space to eat while not blocking the flow from the kitchen into the living room/bedroom, which would have caused issues due to the concrete pillar between the kitchen and hallway. We decided to continue working with them so they would help us manage the renovation project. They helped us find some great fixtures and for the bathroom and they helped us decide on a tile that could be used as both our floor for our entire place and also in our shower. Having a consistent floor throughout our entire space will help it feel more spacious, and was something that we had wanted but weren’t sure we’d be able to find. 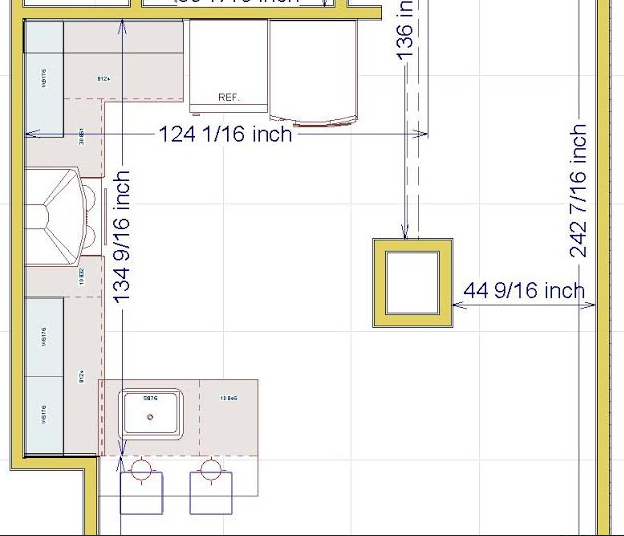 Once we had the layout mostly worked out we went ahead and had meetings with a contractor that Jostar had found to explain the work that we wanted to do, explore our options, and get an idea of what it would cost. Jostar worked with the contractor, contacted all of the various product distributors and scheduled any meetings with electricians and HVAC specialists. Sure, this is all stuff we could have done but to be honest it’s all stuff we HATE doing and it would have taken us forever. We’d basically tell them, “Hey, these are the times we are available to meet” and they’d schedule any meetings for those times. So, yes, we do have to pay a project management fee but we think it was definitely worth it. And I’m saying that before we have even started our renovations. The planning stage was definitely the most stressful part of this whole process and our designer made it infinitely easier by providing suggestions and ideas that we didn’t even know were possible. Our final plan actually ended up much closer to what our original ideas had been before we had started to compromise due to what we thought would be too costly. Don’t get me wrong, this renovation is hella’ costly but their suggestions made us reevaluate the possibilities within our space. Once we had Jostar on board and were well into serious planning mode, we immediately encountered a massive roadblock. If you live in an older condo unit, it’s likely that you may also have a recirculating range hood vent above your stove. If so, you may also share our frustration at how ineffective they are at removing grease and food odours from your kitchen. As a result, a layer of greasy film accumulates on every surface and in order to keep anything clean you end up having to scrub the ever-loving crap out of it, often. We currently have two holes in our unit that vent to the outside of the building – one for laundry and one for bathroom ventilation. We had hoped that we could possibly drill a third one to accommodate a proper, vented range hood. However, part of living in a condominium building means having to get your renovation plans approved by the condo board, and when we proposed this idea to the condo board, they unsurprisingly said no. Requests for any changes to the exterior of a condo building are almost always met with refusal, but we thought we’d try anyway. Their response put us in a difficult position, as this was what Emma considered a deal-breaker. She was unwilling to go through with a huge, costly renovation and invest in new items and surfaces only have them become greasy and sticky due to continued terrible ventilation above our stove. What could we do? This is one solution I get to take full credit for! I looked into the possibility of replacing our vented dryer with a condenser dryer that wouldn’t need to be vented (all of the moisture that is extracted from your laundry while it’s being dried is collected in a container that can be emptied after the cycle is complete). This would allow us to use the already existing laundry vent hole for a vented range hood, instead. Plus, our current washer and dryer combo unit was something we had hoped to eventually replace anyway, as it is in a silly location, is terribly noisy and the venting often leaks water on to our floor. Condensation dryers have been known to have some problems such as longer drying times and an inability to dry large loads, but they have come a long way in recent years, and the Miele unit we ultimately opted for has been highly recommended. With the venting issue out of the way, we were now ready to begin the renos! The next step of the process is preparing their condo for renovations, and although likely stressful, it’s very exciting! The last couple days have been eventful. Essex was absolutely wonderful. The stream train and rivet boat were so much fun. I was sad we didn’t take the dinner train, but there are so many restaurants to choose from, I wasn’t too sad about it. I didn’t realize how wide the Connecticut River was until we were floating along down it in the boat. As we had tickets to the IMAX screening of the newest Doctor Who episode in the evening, we headed back to Manchester and stayed at the absolute best hotel. If you’re ever in Manchester, CT, stay at the Baymont. It’s got tons of character and the best continental breakfast we’ve had. We had the afternoon to spare, so Brandon searched online for something wonderful to do, and found Wickham Park. It’s 250 square miles of different styles of gardens, an aviary, walking paths, gazebos, and forests. We were in the gazebo in the English garden when he went down on one knee and proposed! I was so surprised and happy. After gleefully saying yes, we walked hand in hand through the park. It was glorious. I’m still a bit giddy about it. We had lunch in Newport, Rhode Island today. Newport is a nice place, though crammed full of people right now. Wonder what it’s like in the off season. Lots of shops. We could have shopped all day, if we wanted to, but just checked one store for some travel gifts. In Cape Cod for the next two nights. Beautiful place, but arrived at dusk, so will check out some beaches and other attractions tomorrow when I can see them! The stars are beautiful tonight. They’ve got minimal streetlights here, so the stars shine brighter. I can’t get enough of that cool ocean air. It may just be the prairie girl in me talking, but the air smells fresher out here. Thanks to my dad’s lineage, I think I’m still an east coast girl at heart! The last couple days have been filled with a bit of everything. We’ve taken a tour of Yale, eaten in a restaurant that usually only accepts Yale students(current or past) and their guests, saw more small town Americana, found heaven in a book store, and will be gently floating down the Connecticut River this afternoon. Guilford has been the highlight of the tour so far. It’s one of the earliest towns settled here, and it’s absolutely what everyone is thinking about when they think Colonial Americana. There is a green space directly in the centre of town, and it’s got to be a couple city blocks wide. The houses were built around that square and then out from there. We visited the first stone house in New England, and then a couple more 300+ year old houses closer into town. Our tour guides were so kind and informative. We spent more time in Guilford than we had planned, but we definitely could have stayed longer. It’s a town I could happily see myself living in. Picnicking in the village green, walking to work and home(which may be both by the village green in this fantasy). If you are at all in the area, stop by Guilford. I highly recommend it. We chose to get off the freeway and travel down scenic Route 1. Exactly what we were looking for. Beautiful, winding roads through wooded areas and by numerous old homes. On the way, we made a quick turnoff into the Book Barn parking lot. It’s a beautiful indoor/outdoor shop with multiple genres in multiple locations. We came at dusk, so when the fairy lights in the garden(between the mystery and poetry sections) lit up, it was magical. Yesterday, because we had gotten in to New London so late the night before, we drove back to Niantic and went to the beach for a quick look see. Niantic is a beautiful beach town with a boardwalk. Unfortunately, they were renovating it when we arrived, so we walked down Main Street instead. It’s quietly touristy, somehow without being aware of it. After, we drove to Mystic, where it absolutely knows it’s touristy, and shows that off quite loudly. We sat on the boardwalk, dangled our feet over the edge, and watched the drawbridge let some tall boats through. Mystic wasn’t for us, but I can’t deny it’s beauty. Lately, everything’s been a joy to look at. Guess I just like being near water. We’re heading north again to Essex for a ride on a steam train and then a leisurely boat ride down the Connecticut River. I’ll try writing again in a few days(give or take). I can’t believe we’ve been here less than a week. It’s been so much fun, we’ve done so much, and still have a couple weeks for more adventures. Connecticut is both bigger and smaller then I thought it would be. It’s such a beautiful place, with rich history and fantastic architecture. The first day was all flights, as we had layovers in Toronto and Detroit, but it was surprisingly relaxing. The Detroit airport surprised me with a stunning light and music art piece in a pedway that could have been drab otherwise, and a tram that made our journey to a different gate much quicker. Our official first day of vacation(if you’re one not to count flights) was ideal. Slept in, spent some time in the hotel pool and suntanned afterwards. Then we spent a couple hours just driving around to various little towns and eyeballing the amazing old houses. Discovered a seafood restaurant on the way back, stopped in and had some of the most amazing lobster. After we filled our bellies, back to the hotel we went to rest and digest. Yesterday was Hartford and the Connecticut Science Centre. It’s a giant building with 6 floors, a giant blowup dinosaur, and a rooftop garden. Yes, there are a lot of things for kids, but there was enough for the “big kids” too that we had a lot of fun. After walking around there for a couple hours, we walked into downtown and found a food truck. We ate in the park by the Connecticut River and the weather was perfect. Still in the midst of packing and getting everything ready for the trip tomorrow, but I wanted to share how proud I was by the fact that I didn’t pack a lot of stuff. Probably still looks like a lot of stuff, and Brandon and I combined still filled the suitcase, but I’m happy I stuck to my 333 Project items(with a few extras specifically for the trip). 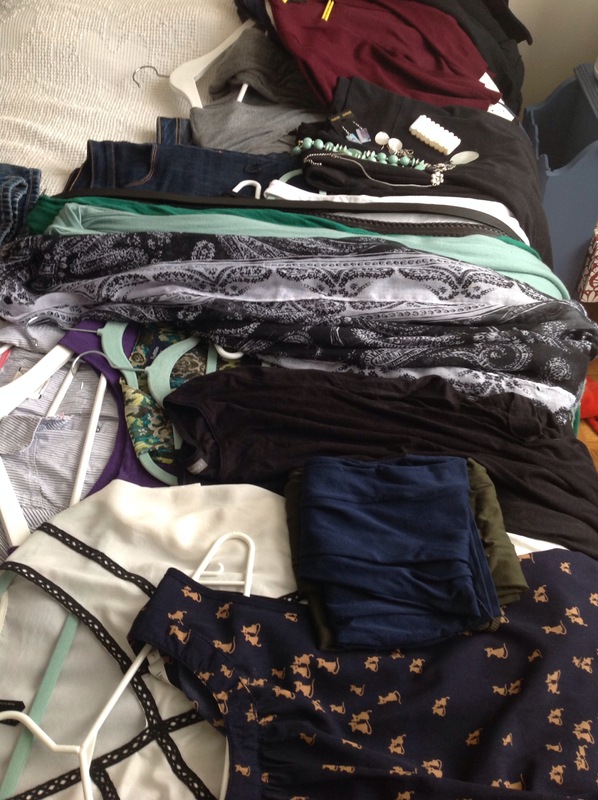 3 pairs of shoes, 4 cover ups (cardigans, hoodie, jacket), 1 skirt, 1 dress, 2 tank tops, 2 pairs of jeans (full-length and capri), 3 blouses, 5 casual tops, 3 belts, 3 scarves, 2 pairs of leggings, and 8 pieces of jewelry. 37 in total, not counting pajamas and underwear. I will be trying to blog from where’ve we happen to be, but there will be no schedule whatsoever. I’m still getting posts from Jessica about her renovation, so I’ll try to keep some semblance of schedule with her awesome project. Brandon and I are flying out to Connecticut very early tomorrow morning, so tonight will probably be more of an extended nap then a full nights sleep. Oh well. It’s for adventures and relaxation! This is part 2 of Jessica and Emma’s bi-weekly renovating series you’ll be reading about on here. Today, she talks about the process of planning. Finding out what works and what doesn’t. The plan…man, that’s changed so many times I can barely remember all of the variations. Emma and I debated these ideas for months – years, even. Initially, our plan was to do only the bathroom and then do the rest of the space in maybe a year or two. We considered the bathroom a high priority, as we have a sink that splashes everywhere whenever you use it (don’t mix shallow sinks with a high faucet…you’ll end up with your entire bathroom being a splash zone). Also, our neighbours are very heavy smokers and their smoke drifts through our bathroom and stinks up our place. We’re pretty sure there’s some shoddy construction behind the shower walls that’s the main culprit of the smoke drift. These two things made the bathroom renovation something that had to happen in the summer, before it’s winter again and we have smoke drifting into our place and we’re unable to open our windows because it’s -20 C outside. Can we find a Murphy bed/sofa that is decently priced and fits well into our bedroom/living room space? 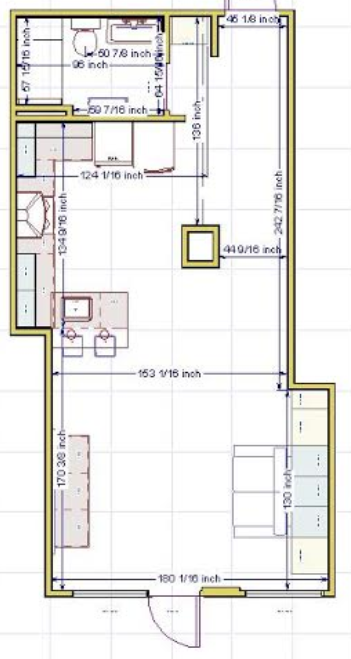 How do we create some privacy in our new open bedroom/living room? What we came up with is a Murphy bed/sofa from Expand Furniture and a softwall from Molo Designs; both from Vancouver, B.C. 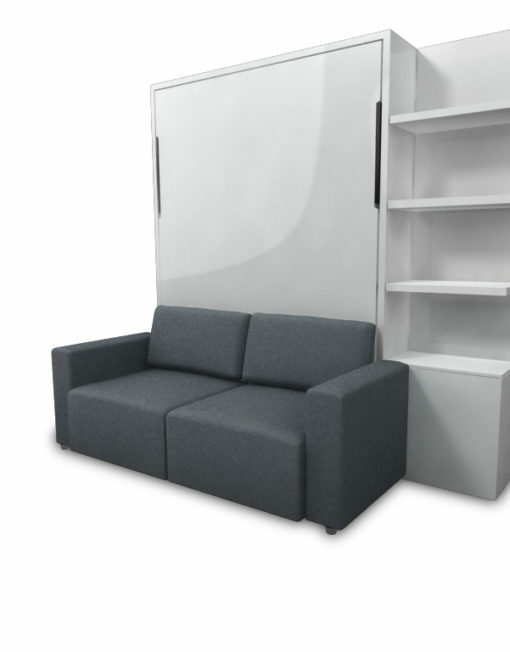 The Murphy bed/sofa is half the cost of what you’d find at Resource Furniture but looks just as good (although there are less colour options). The softwall, though pricey, is compact when folded up. It can be stretched the entire length of our living room to cut it off entirely from the kitchen or, because it’s flexible, can be wrapped around our bed/sofa. Also, it’s pretty darn swank when you add those LED lights! 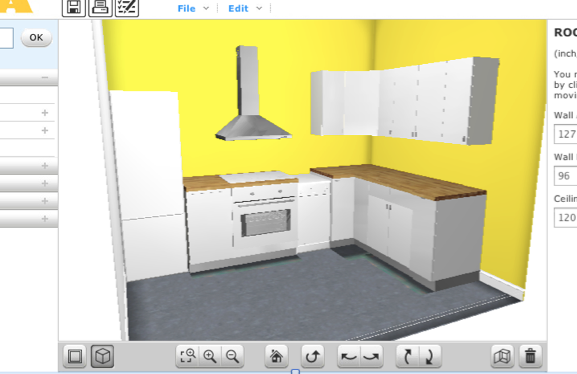 Once we answered those two questions we started working on a kitchen layout. When we decided the current kitchen and bedroom walls were coming down it made the most sense for the kitchen to be relocated into what is currently our bedroom, and for the living room and bedroom to become one area. By having the living room and bedroom as one we could finally have nice big windows in our bedroom (currently our bedroom is SUPER DARK with terrible lighting) and we’d be able to hang out in bed and watch TV more easily on our big projector screen. That’s something that we love to do all the time, anyway. It’s why we bought a pull-out couch for the living room! Spending hot summer days TV bingeing in bed is a thing we love to do. We moved around where to put everything multiple times using Ikea’s handy kitchen planning tool. What we eventually came up with was an L-shaped kitchen with an island in the middle (not in the picture below). We wanted to also have a place to eat so on the outside of the island we planned two stools on the outside for seating. I think we were so happy that we’d have more storage space and countertop to work with that we sacrificed the space between kitchen counters and the island. We didn’t really contemplate another option for our kitchen besides an L-shape. We left approximately 30 inches between the island and the kitchen counters – just enough to squeak by each other. It wasn’t ideal, but it was certainly a hell of a lot better than what we were currently used to. Luckily, we had been throwing around the idea of taking our renovation plans to an interior design company for some ideas on how to make our space work a bit better. I had some questions about our bathroom that I was hung up on and Emma wasn’t particularly satisfied with the kitchen layout. After consulting with a designer at Jostar Interiors we decided to have them provide us with drawings and design options for our space. It wasn’t cheap, but what they came back with was infinitely better than what we had originally thought up. In the next post in the series, we’ll look into what Jostar cooked up for them. I think it’s a brave and brilliant change for the space! I’ve talked about this before. This kind of fear is a rotating door in my life. It may go away for a while, but it always comes back around. I’d call it paralyzing, but I don’t want to blow it out of proportion. I’m not sure where I learned this, but I’ve always been one to take up the least possible space. I don’t want to inconvenience anyone by existing. What kind of a life is that? I know so many people that go out and carve their own niches, and I envy them. I do. I admit, I’m occasionally a jealous person. I’ve always wanted more from life, but have never had the strength to go out and get it. Whatever It is, I’m still figuring that one out. I usually know what It isn’t, but that isn’t as helpful as you would think. In what is becoming a common theme in my writing, my inspiration for this post comes from one of Grace Bonney’s “After The Jump” episodes. Turning fear into courage is something I believe I’ve never been able to do. I’m sure friends and family would say otherwise, but we are our own worst critics. Whenever the need to meet a challenge has risen, I choose fear. I choose failure. I choose to make myself as little as possible, and yet still worry that I’ll never make anything of myself. This is not what I mean when I promote living small. A little dry humour to supplement this crushing confession. I’m angry at myself. Finally. This is actual personal growth, because I used to be angry at everyone else. I blamed them for my failures and holding me down, and my self-fulfilling prophecies were never my problem. I am holding myself down. All I can do it learn to take the opportunities when they arrive, and seek out ones that do not come to meet me. I am working hard at lessening the urge to tear everything down at the littlest hint of success. It’s been damn hard, I’ll tell you that. This blog is proof. This was a personal challenge to myself, and would have been gone a long time ago if it were not for Brandon’s kind words and support. I have tried a few different ways to make this work for me, and I realize now that I cannot write on a schedule. I don’t function that way, so I’m choosing to change the way this blog works. I will write sporadically, and when I have something to say. It’s hard for me to admit, but I do have something to say.